February was a very good month. I discovered a few new mystery authors, and read a some terrific novels. And, I'd recommend What Would Google Do? to anyone interested in how the Internet has changed the world. Here are the books I read last month. The Hunger Games by Suzanne Collins - A young woman competes against other teens in a battle to the death in the Hunger Games, a national competition in what was once North America. Terrific YA novel. I can't wait for the next in this series, due out in September. A Deadly Silver Sea by Bob Morris - Zack Chasteen and his very pregnant wife (8 mos.) are on a luxury cruise ship's maiden voyage when it's hijacked. Think McGyver. Love that Zack. Wild Sorrow by Sandi Ault - Jamaica Wild works for the Bureau of Land Management near Taos, NM. When she and her wolf, Shadow, are tracking an injured mountain lion, she takes shelter in a closed Indian boarding school. After she finds the body of an older Anglo woman, the local tribe members tell her the stories of the school. But, someone is stalking Jamaica, and she doesn't know if it relates to this death, or not. Third book in a series that I had not read. I'll be reading Sandi Ault's books in the future. The Mighty Queens of Freeville by Amy Dickinson - Dickinson, the columnist who writes Ask Amy, tells the story of her divorce and raising her daughter with the help of the strong family members, women, who live in the small town of Freeville, NY. A positive memoir for a change, in which she doesn't blame other people for her life. 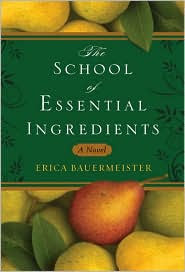 The School of Essential Ingredients by Erica Bauermeister - Wonderful, sensual novel of the Monday night cooking classes in Lillian's restaurant, classes that bring together eight people who need more than just food. The smells and images in this book are a treat for the senses. A Little Learning by Jane Tesh - Madeline Maclin, former beauty queen turned investigator, is now married to her long-time best friend. Cases are slim in the small town, so she agrees to work on a riddle that will help a potential heir inherit, but she gets caught up in the death of a school teacher. The Big Dirt Nap by Rosemary Harris - Caper novel for Paula Holliday, who identifies a body, and gets caught up with Ukrainian bad guys, plans for a casino, and the search for her missing friend. Very Valentine by Adrianna Trigiani - A novel about a thirty-year-old woman who is passionate about her job as a creator of wedding shoes. However, she has to fight her brother for control of the family business since he wants to sell the property in Greenwich Village, and she wants to keep the business going. Best summarized as the story of a woman who finds her passion in life. This is the first in a trilogy. Absinthe of Malice by Pat Browning - When her best friend, a reporter, is murdered, Penny Mackenzie takes over the small town investigation, a search that will uncover the California town's secrets. What Would Google Do? by Jeff Jarvis - A fascinating analysis of how Google, Facebook, and other applications are changing the world. This book is not a technical analysis, but a well-written book that reads quickly. Among the Mad by Jacqueline Wnspear - The best Maisie Dobbs novel yet, and one that appears at #9 on the NY Times Bestseller list on Sunday. A man blows himself up in front of Maisie, and she tried to prevent it. Soon after, Scotland Yard asks her to participate in an investigation, when a letter sent to the government mentions her; a letter warning there will be more deaths if someone doesn't recognize that WWI vets and others are suffering, out of work, lacking food, ignored. The Graveyard Book by Neil Gaiman - This year's Newbery winner. A boy whose family is murdered when he is a baby escapes to the nearby graveyard, where the ghosts adopt him, and raise him as Nobody Owens, protecting him, and educating him, so that he'll be able to survive. Terrific book. DeKok and the Dead Harlequin by Baantjer - I had never read one of the 60 mysteries by this popular Dutch mystery author, but I'll be looking for more. Dutch Homicide Inspector DeKok is challenged when a man writes him a letter, saying he's going to commit the perfect murder, and he'd like to meet with DeKok to discuss it. Docketful of Poesy by Diana Killian - Academic and scholar, Grace Hollister, is flattered that a Hollywood company wants to film the story of her exploits, but when her boyfriend, a jewel thief turned antiques dealer takes her back to England, the movie company follows. As does murder. I have added so many books to my TBR pile because of your amazing recommendations: The School of Essential Ingredients (which I just picked up from the library yesterday); What Would Google Do (which I just put on hold); and the Maisie Dobbs series. I have heard great reviews of the Hunger Games, but I am just not sure that I can stomach the subject matter. Wonderful recommendations! And I really like your summaries--enough to give me a feel for the book, but not too much! Thanks! Thank you, Molly! I'm proud to be an enabler. I hope you like the books. As to Maisie Dobbs, I emailed some friends yesterday who said they couldn't get into the first couple books in the series. If you have that problem, I recommended they just read the current one because it definitely could function as a standalone. Just a heads up. No book is for everyone. If you don't like the idea of The Hunger Games, then it's not for you. Thanks, Rebbie. That's exactly what I try to do - give you an idea of the book, without giving away the story. I love Adriana Trigianni. And I enjoyed Very Valentine. Trigiani always does such good Italy parts. I was a little disappointed with then ending, but realize she had to leave us hanging for the rest of the trilogy. I just hope she doesn't take too long to write the next two. I wish I read faster. I love reading your lists, and I especially enjoy learning about some non-mysteries that you enjoyed. I'll add several from your February list to my huge TBR. I'm actually afraid my office floor will collapse under the weight. Must remember to use the library more. Thanks so much. Thanks, Samantha! I hope March goes as well, too. I know I'm reading a good one now, even though it's an April release. I'm reading Jane K. Cleland's new mystery, Killer Keepsakes. I'm with you, Melanie. I can't wait for the next one in the series. This one was wonderful. Despite the letdown because there wasn't more at the end, I did like the ending. Oh, Janet, I wish I could read more, too. And, then I spend half a day working ahead on the blog, so I lose all of that reading time. But, it's important to me that I get the chance to share all of those titles. Thank you! Sometimes those non-mysteries are wonderful discoveries. I found a few terrific books in February. It's hard to "not" own the books, though, isn't it? Even though I'm a librarian, there's something about having all of those books around the house that's special. Sounds like some great books. I have the Sandi Ault book and I'm looking forward to reading it. I think you'll like the Sandi Ault one, Yvonne. I love the way you summarize your books. I have to add the Baantjer books to my list. Thank you, Gavin. I really enjoyed the DeKok book. I'm hoping to pick up more of them. I'm still smiling about your review hitting the Naperville Sun. In fact, I just printed it out for my PR file. You're welcome, Pat. And, you better keep moving on that book. There were over 50 views of that review in the Naperville Sun! I think that's one of my highest syndicated readership numbers. (smile) Good luck!